If you are currently searching for a new Labrador puppy, then your first step will be to find the right breeder. This is a vital part of selecting the best Lab puppy to bring home, and not a task to be taken lightly. In this article we will help you to make the right decision, by giving you some warning signs to look out for. Not all Labrador breeders will be equal, and in fact some will be far, far better than others. 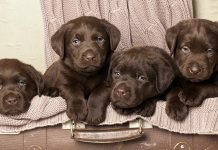 [wp_ad_camp_5]Breeding Labradors is a big responsibility, and anyone taking it on should be well equipped to bring up the healthiest, best tempered pups possible. They also need to be able to potential help and advise you regarding any concerns you might have about your dog, throughout his life. And your puppy’s life might well depend upon the actions of his breeder, even before he has born. Because good breeders go to great lengths to ensure that their puppies have healthy genes and a great start in life. So let’s take a look at my top 41 ways to spot a bad Labrador breeder. A bad dog breeder is not necessarily a bad person, a puppy farmer or lacking in good intensions. 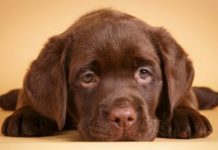 It can be tricky to spot a bad Labrador breeder, especially when you are excited about getting a new puppy and reluctant to wait. But finding the right breeder will set you off on a journey of joy with your new friend, and help you get away from some horrible avoidable problems. If you spot any of the following signs of a bad dog breeder, then you may want to consider politely moving on to the next on your list. When you contact the breeder for the first time, they should not let you do all of the talking. They should show an interest in who you are, your experience with dogs and Labradors in particular. They should want to be reassured that you are going to be the best possible person to look after one of their puppies. A lack of interest in anything beyond whether you are able to pay is a bad sign. A good breeder will make sure that at a minimum both parents have low hip scores, elbow scores of 0, clear eye tests from within the last 12 months and are DNA clear for Progressive Retinal Atrophy. You can find out all about health screening for Labradors here. If the breeder assures you that the parents are health tested, but then avoids or delays sending you copies of the health certificates then you have to assume that this is because they don’t have any. If they say they are unable to scan them in to the computer, then you may have to trust that they will be on site when you visit. If they aren’t upon arrival, then it’s time to politely walk away. A good Labrador breeder will have dogs in their life for a reason beyond breeding. They will either be worked, compete in agility, obedience or be shown in the ring. They should be a loved and valued member of the family, or sporting team. No dog should be kept for her breeding value alone. Some very good breeders will have a couple of litters a year from, but in general multiple litters should set alarm bells ringing. Run a google search on the breeder’s name or their kennel name. If they appear repeatedly in the wanted ad’s pages then walk away. Good breeders will never sell their puppies to pet stores. Some good breeders will have dogs of different breeders, but they will always fall within a set and understandable category. [wp_ad_camp_2]For example working bred Labradors may live and work alongside Spaniels or HPRs. Be wary of breeders with various breeders of dog, that have no relation to each other in terms of the breeders sporting interests. If your breeder has various female dogs from different breed categories, you need to ask yourself why. Under no circumstances bring home a puppy without seeing the mother. A bad breeder will not simply tell you that you cannot see her, they will concoct a viable lie. Common lies are ‘she has gone to work with my husband today’, ‘she has gone on holiday with a friend’, ‘she is having a break from the puppies due to mastitis’, or even ‘she has died’. On rare occasions these excuses may be true, but as a buyer you simply cannot run the risk that the breeder is actually a puppy farmer who has never even met the mother, or that the mother has been kept away due to problems with poor health or aggression. All puppies will get messy occasionally, but a puppy living in urine or faeces will smell strongly and look dirty. This is a sign that the breeder either does not understand puppies at all, or that they are negligent in their care. Either way, they are not the breeder for you. A good breeder will give a puppy plenty of space, warmth and light. If your breeder is keeping the litter in a confined space where they cannot stretch their legs, if the puppies are cold or if they live in darkness, then the breeder is not taking proper care of them. The pups will be less likely to grow up to be well socialised, healthy and confident dogs. Avoid any breeder who will not let you meet the puppies at their home. If they ask to meet you in a public place, then walk away as they have something to hide. Again they will give you excuses that could be believable, but it is simply not worth the risk of endorsing a puppy farm, which is the most likely reason for avoiding you visiting their premises. Puppies require stimulation and comfort. If you visit the puppies and they are living in a barren space, with no soft bedding, then this is a sign of a bad breeder who does not understand or does not care about their need for interaction, play and comfort. A good breeder knows how much food their puppies need. Underweight puppies could be suffering from an illness or simply not being given enough food. Overweight puppies are unhealthy too. They are more likely to suffer from joint problems and rapid growth, and a good breeder would be aware of this fact and not put the puppies in the position of becoming over weight. A good breeder will be entirely transparent. A bad breeder will avoid questions about the stud dog, what his purpose is and where he lives. You should have the option of going to visit the stud dog as well, if you choose to do so. Be wary if the mother of the puppies does not appear to recognise her name when the breeder speaks it. Or if in fact the breeder gets the mother’s name wrong. This is a sign that the dog is lacking in training and in bond with the breeder, who may only be using her for her ability to produce puppies and not giving her a fulfilling active life. Your breeder should be happy to let you know who her veterinarian is, in case you request a reference from them. Any evasion on this part should be taken as a sign that they may have something to hide, in terms of their animals welfare or their interest in their dog’s health. Vet care is a vital part of dog ownership, and a breeder should have a good relationship with their local veterinarian. Good breeders know that puppies are not ready to go to their new homes until they reach 8 weeks of age. A couple of days shy of this for convenience shouldn’t raise any alarm bells, but any more than that suggests that the breeder is keen to get rid of the puppies, and doesn’t understand or care about the benefits of staying with the mother until this point. They may well give you excuses such as, the mother is fed up with them or they are weaned, but these are not relevant factors. Puppies need their mothers and littermates for much more than feeding. You can find out more about the downside of brining home a puppy under 8 weeks in this article. 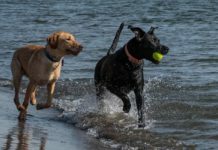 A good breeder understands that most people are not equipped or prepared to take on the responsibility of two Labrador puppies at once. 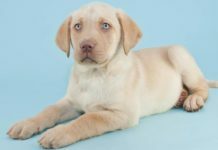 A bad Labrador breeder who simply wants to make money and sell puppies will encourage you to bring home two dogs, because it is financially easier for them to make a double sale. 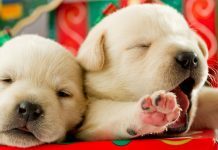 To understand the difficulties involved in raising two puppies at once, check out this article. The way in which your breeder describes her litter will be telling. Buzzwords such as ‘rare’ are to be considered with caution. You want a Labrador breeder who understands what makes the Labrador breed so great, and wants to reflect this in their puppies. Unusual dogs are of course interesting, but they might be lacking in the qualities that you are looking for. Health and temperament should be the primary considerations when making your decision. The mother of the puppies should be clearly bonded to her owner. She should want to be near her, listen when she is spoken to and seem relaxed and happy in her company. If she is not then she either is has either been lacking in attention and training, or she does not have the typical Labrador personality that you want to be passed on to her offspring. A breeder who tells you that the puppies are KC or AKC registered should be able to provide evidence of this to you. If they are not, then you have no way of telling whether this is true. If you wish to compete with your Labrador then you will need this KC paperwork, but even if you don’t you can not be sure that an unregistered Lab has parents who are a healthy match in terms of their pedigrees. A breeder who registers her dogs with another agency is doing so because her dogs’ cannot be Kennel Club registered. The Kennel Club register dogs based on their lineage, and not upon their health. To be registered with the KC a Labrador does not require a single health test, nor inspection of the breeder’s dogs or property. A bad breeder will imply that KC registration is some kind of seal of approval, when in fact it is simply evidence of the dog’s ancestors and nothing more. A good breeder is familiar with their breed. Understanding their exercise, dietary, training and care requirements extensively. 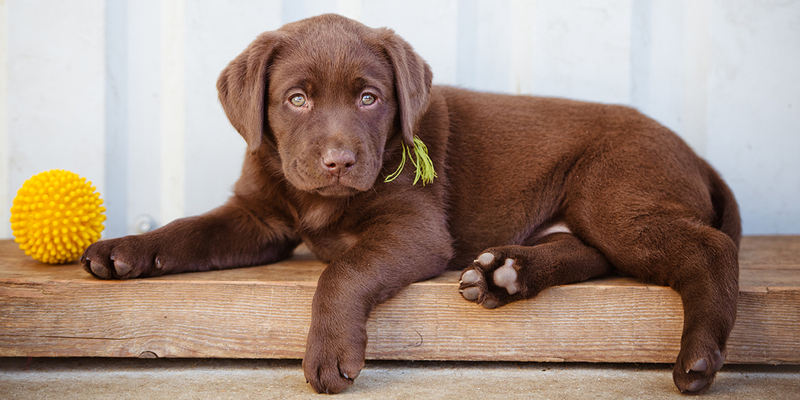 If the breeder seems unsure of any aspect of Labrador care or life with Labradors, then they may not be sufficiently knowledgable to produce healthy happy puppies and home them accordingly. A good breeder will happily provide you with references from previous puppy buyers. A reluctance to do so suggests that they are keeping a disappointing element hidden, or that they are not interested in their puppies once they are homed. Puppies should be curious and alert. When you sit down amongst them they should pile into your lap, tug your clothes and lick your hands. If the puppies seem shy or reserved they may be unwell, or not have been properly socialised. A good breeder choses her dogs carefully, picks matings based on a wealth of knowledge of the breed and knows other dogs relevant to her own. They should be able to pick several names out of the pedigree and give you some background on the dogs that they relate to, and what you can expect in terms of temperament and breeding. Labradors are a pedigree dog breed, and as such a part of a closed register. It is important that your breeder makes sure that they don’t mate two dogs who are too closely related to one another. Coefficient of Inbreeding or COI is a measure of how related a pair of dogs are. 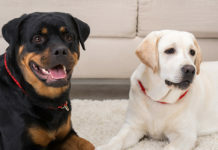 A bad breeder will mate two dogs with similar pedigrees, without having an interest for the impact this will have on future generations of the breed and their health. A good breeder will only mate from the healthiest and nicest of dogs. Labradors have lovely personalities in general, so there is no excuse for breeding from a nervous or grumpy dog. Your puppy’s temperament will be in part be a product of his parents’ temperaments. So it is in your interests to happy, friendly Labrador parents. But it should be in the breeder’s interest too. A bad breeder does not care what the puppies’ personalities are like, so they will breed from parents who are not up to standard in terms of temperament. Be wary of a breeder who chose a stud dog based upon their location. You will of course very occasionally find that a breeder uses a dog just down the road for perfectly legitimate reasons, but their explanation will be something like ‘I found the perfect, kindest, fully health tested stud dog in the world – and amazingly he lives just around the corner!’. A breeder who only remarks upon the convenience of the stud dog, is not taking the time to make the right decision for the puppies. A good breeder takes the time to get to know her buyers, and assess them individually. A bad breeder is not interested in who homes her puppies, just that they hand over the cash and take them off her hands. If when you speak to the breeder they let you know that puppies will be sold on a first come first served basis, this is a real warning sign that all is not as it should be. A good breeder keeps her dogs for reasons beyond breeding. Even a busy kennels who use their Labradors for working, will often have a couple of old dogs resting by the hearth in the house. They might sell some older trained dogs from time to time to free up space for a new line, but they will not let every dog that is past it’s prime walk out the door. A bad breeder will sell every single dog who either does not produce enough puppies or is past her prime, and will never keep a dog on for sentimental reasons. A good breeder will let you meet the entire litter, even if all of the other puppies have homes assigned to them. [wp_ad_camp_1]It enables you to see that they are all a similar size, and in great health. A bad breeder will hide the remainder of the litter if there is a problem with any of them, or if one or more of the puppies is displaying concerning signs. They may also tell you that you cannot see the rest of the litter because they don’t actually have them on site or own them at all. A good breeder will show you where the puppies live. Allowing you to seeing the conditions that they are being raised in. A bad breeder could keep the puppies living conditions a secret for any number of reasons, including poor facilities or because there are numerous other litters in the same area also for sale. They should be happy for you to see everywhere that the puppy has been kept, and to make your own judgement on the conditions. A good breeder cares about who takes her puppies home, and wants them to make an informed and considered opinion. If you ask the breeder whether you can sleep on your decision, and their response is ‘you can do that, but when the puppy is taken it’s taken’, or ‘of course, but I have got another potential buyer coming to see her in a couple of hours’, don’t allow yourself to be pressured and be aware that this is probably just a sales technique. A good breeder raises their own puppies, they do not sell on someone else’s behalf. A bad Labrador breeder, who says that they dogs are owned by another party who is unavailable at the moment, is one to be regarded with nothing but suspicion. Good breeders want to meet and get to know all of their potential puppy parents, and will not miss out on this opportunity by employing an agent to make the sale. A good breeder will not be able to afford to make a living on the few responsibly raised litters that she produces. They will have another role in their life, whether that is in a related field such as dog training or some other area of work. If the breeder clearly makes their living through puppies alone, then they are unlikely to be able to give the care and attention that raising each litter requires nor make sound decisions about the homes they send their puppies to. A good breeder cares about the health of their puppies and wants to do what is best for them. A bad breeder will only feed them the bare minimum quantity and quality required to keep them looking fit for sale. Ask the breeder what the puppies are fed on and why. It should be a good quality food, appropriate for Labradors and for puppies. Bad breeders will use the cheapest option and may given inappropriate food such as adult kibble to young dogs. A good breeder is aware that well socialised puppies grow up into confident, happy dogs. A bad breeder will keep puppies away from the home and visitors, and won’t have made an effort for them to meet lots of people of varying ages. Any downgrading of the importance of socialisation to a growing puppy is a real warning sign of a lack of canine knowledge. A good breeder will let you know that you can contact them with any questions, and that they will be happy to take the puppy back at any point in their lifetime if your circumstances change. They should encourage you to get in touch if you have any worries. A bad breeder will see the exchanging of money and homing of the puppy as the end of your relationship. A good breeder will want to know how their dog’s puppy is getting on. They will invite you to email them photos or friend them on Facebook. A bad breeder may not even ask for your contact details, and will not show interest in being kept informed of the puppy’s progress. There are some amazing Labrador breeders out there, but there are some pretty terrible ones too. The choice you make will continue to effect you for the duration of your puppy’s life, in terms of his health, temperament and even your bank balance in the long run. A bad Labrador breeder might appear above board in a number of ways, but fall down on one or more of the above points. I highly recommend that you read this list before you visit, and again afterwards. Remember that all puppies are adorable, and don’t let this cloud your judgement during your time spent with the breeder. I have on several occasions walked away from bad breeders based on gut instinct alone, only to realise what was bothering me when I reflected upon the situation at home later. Although this was very upsetting at the time, I am incredibly thankful now that I did walk away and take the time to find the right breeder for my new puppy. Is there a list of “bad breeders”? If not, why not? Has anyone heard or had experiences with Udonstar in Qualicum Beach, BC Canada? Don’t forget the other 3 recognized kennel clubs in the US and Canada. American Kennel Club (AKC) United Kennel Club (UKC) and the Canadian Kennel Club (CKC)… not to be mixed up with the continental kennel club which will register anything including mixes, they don’t verify pedigree and not reputable or recognized by the other Clubs. 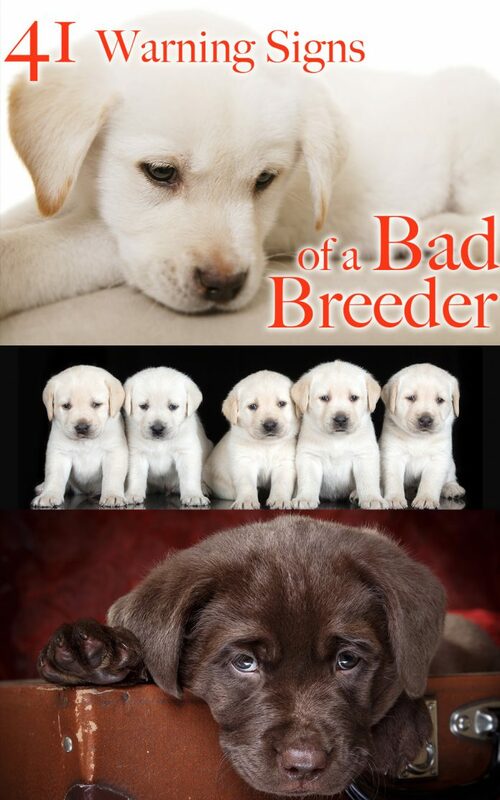 Should we report obvious bad breeders as we discover them in our search for our new lab? In the US who would we report them to? Pippa can you please cover Champagne Labs with blue/green eyes? Looking at one and not sure? We purchased a yellow lab (Ivy) from a breeder (Amanda Zaier) in Mt. Morris, Michigan. Ivy was not gaining enough weight, and at 4 mos. was diagnosed with a liver shunt. She’s been evaluated at Michigan State University and at 6 months after meds and restricted diet is now old enough and strong enough to undergo corredtive surgery. Several vets along the way have asked about info regarding the litter as this is most likely congenital. Obviously, this management/treatment has been and will be very costly; however, we’ve opted to proceed. I decided to contact the breeder to let her know so she could alert the people who purchased the othere puppies so they could watch for signs. I’ve texted several times and made it clear that we did not expect anything from her monetarily and I sincerely thought she’d want to know. I’ve never received a response from the breeder which I can only assume means she has no intention ackowledging the vets’ concerns or alerting the other owners. I do have info regarding the sire and dam, and don’t know if I should put any other alerts out there and, if so, how to do that. We’ve had three other labs over the past 23 years (two from puppies and one rescued at 9 yrs. of age). They all lived a long life and we want that for Ivy also. I guess I got lucky, my primary intention was not to be a breeder, but I have such an amazing dog that I bred her. The one thing I didn’t do is get health certificates although I did discuss her health with the vet before I would even consider it. I kept most of the pups past 8 weeks because I wouldn’t let them go to anyone that I couldn’t be sure of. Now I was a very inexperienced breeder and so I got a great deal of advice from the breeder I got my baby from. She was 4 1/2 years old before I bred her. I still keep in touch with my puppies new parents as well and they are about 18 months. I even kept one pup. Everyone of their new homes is delighted with them and they are active busy babies. Good info, I didn’t notice if you wrote about this or not, but rare COLORS is a bad sign too. Labradors are Black, Yellow and Chocolate. Silver is not a Labrador color. Neither is “white”, “cream”, “champagne” or “charcoal”. And breeder with those colors should be avoided. I recently went through the process of searching for/finding a new Lab pup to join our family. You article is spot on. One thing someone told me is that I was “buying” a breeder, more than I was buying a pup. Therefore, for my search I HAD to stop looking at all those cute little puppies and focus on the breeder and the paperwork (pedigrees, health certificates, etc.). I did internet searches on the breeders I was interested in for their “ethics”. When it comes to making money, some breeders “cut corners.” I am retired, and made it my FULL TIME JOB to look for a pup (when I decided it was time to add another Lab to our family to join one existing lab, and after saying good-bye to our 15+ yr old lab, Allie). I ended up creating a spread sheet to keep track of all those I contacted and spent 40-60 hrs for about 5 weeks searching for what I was looking for. I can’t believe how hard it has become to find a good breeder with really great dogs! I contacted over 90+ potentials. I narrowed it down to about 27 worth looking at further. then to 13… then to about 7-8 that I was more serious about. I ruled out a few breeders that LIED about their dogs… saying they stud had excellent hips, when a particular stud only had an OFA prelim at 18 mths; now 5 yrs old, they never got the final OFA for hips. I actually contacted the original owner of the dog and she said “do not get a pup from any litter that he sires”, the person that bought the dog from original owner promised they would get final OFA on hips and lied… then continued to use him in her breeding program, lying to puppy buyers that Sire had excellent hips and basing cost of pups on that info. I tell this story so that other puppy-buyers can become aware that “breeder” does not make them a good person… it is business to some and they will lie. I would not even consider another dog from this breeder as they proved they are not ethical. I also found some people that seemed to have multiple dams with litters born on same exact day. I looked at all those pups and wasn’t sure which dam/sire combination they actually came from. My gut feeling said stay away from THAT litter? who are the dam/sire anyway? I came across a lot of weird stuff when looking for my pup. In summary, look for the breeder, the pedigree, the health certificates, look at the parents… then allow your self to look at those cute little puppies; don’t be swayed by the little furry cuties before looking into what really matters. All little Lab puppies are adorable. Focus on what will matter long term, breeding (parents, pedigree) and health (health certifications). Terry, which state? I’m in Missouri and just beginning my search…. Great post – and so true! I had to put down both of my dogs within the past 2 months because of poor breeding. Found out they had hip dysplasia at 6 months old & the only thing we could do is give them the best life we possibly could. The past year has been very difficult taking care of 2 12 year old dogs with severe hip dysplasia. It’s truly heartbreaking to watch all because of bad breeding. Unfortunately that breeder is still breeding dogs. Just wish there was something that could be done to stop her so others don’t have to go through the heartache & the dogs don’t have to go through the pain. What if the breeder says the puppies can go to homes from 7-8 weeks, but has health certificates? Does this mean I shouldn’t buy from her? Between 7-8 weeks is typical, though in most states its illegal to sell a pup before 8 weeks. A couple days earlier because of how the weekends fall isn’t a red flag. Depends on what the breeder means by “health certificate”. Good breeders will have their pups seen by the vet around 7 weeks for their first health check up and you’ll get paperwork to support that. A real “health certificate” can be provided but that’s usually only needed if the pup is going to travel via airplane. WE have just got a Lab pup 2dayz ago. we have noticed more when she is resting she has quiet rapit breathing.she is 8 wks is it momal. Local knowledge in the area the breeder is located should give you first hand information . The age of the internet may open a bigger window to what is available globally. Personally I don’t let Puppies go until they are not puppies! But I can see the attraction for many for a few weeks of the dogs life. Thanks for your comment Robert. Local knowledge is certainly a precious thing! Just happened on your site,and although we have owned four labs before ,found some very interesting information.Our last dog left us for the kennel in the sky for awelldeserved rest after 15 years with us,we planned to have a6 month break,and see how things went without adog,but after2months the house is empty ,and nofriendly face towake you up in the morning,so, we are going on saturday to see some lab puppies and hopfully there wil be one for us. One additional trait of a a bad, or at least suspicious, breeder is the lack of any official results from field trials, match shows etc. “The dog works on the practical hunt very well.” is heard too often. And naturally these immense practical skills have no evidence in photos. Another thing: I’d like to request an article from You Pippa on the topic introducing a new puppy to the pack. I am getting soon another retriever. My existing retriever is now three years old. What to expect, when the new puppy arrives? How to deal with jealousy issues? Furthermore, should I have separate commands for both dogs or go with same commands for sitting etc? I’ll bear your request in mind Tapio! I have recently brought a new pup into my own set up, so it is a pertinent topic for me.